Much of my writing on the Constitution is inspired by an effort to bring Americans together in understanding our founding principles. The Constitution itself is not Republican or Democrat, liberal or conservative, it is American, but too often today Americans spend more time being confrontational while failing to seek our common ground. This situation is most evident in the acrimony and distrust on display in the United States Congress. While I have watched this acrimony develop and try to make a contribution in my way to address the problem, I had not examined why it exists. 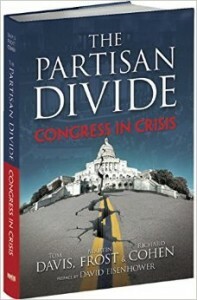 The Partisan Divide explains how we have come to this situation in detail and offers some ideas as to how to overcome the gridlock in Congress. When people complain about how the president oversteps his constitutional authority, this book gives insight into why that happens: Congress has failed to assert its constitutional powers to control the executive. Few people could have the insights into the problems with Congress that Republican Tom Davis and Democrat Martin Frost bring. They have 40 years combined service in Congress. Both served as the congressional campaign chairmen for their respective parties. Along with journalist Richard Cohen, who has been writing about Congress for The National Journal, Congressional Quarterly and Politico Davis and Frost have answered an important question that has been on my mind: How have we gotten to such a point of political hostility? While they address the usual suspects, such as the partisan media (e.g. Fox News and MSNBC), as I read the book it became clear that such media are more the product of certain phenomena than the cause of the problem. (5) Increased mobility of voters and workers, resulting in less community identification. The result of these dynamics are the election of House members who are rigidly ideological in their approach to government. Such rigid ideology is rewarded with reelection. Departure from the ideology, whether liberal or conservative is punished with defeat. The result is a Congress unable to assert its constitutional authority and allows the executive branch to expand its own authority beyond constitutionally prescribed limits. The Partisan Divide has provided a new understanding for my own frustrations with the expanded executive branch and the dangers that poses to our freedoms. The book proposes a number of remedies to address the problems. Among the proposals are suggestions regarding the conduct of primaries and how congressional districts are drawn. There is also a brief discussion of a dangerous constitutional amendment providing Congress expanded powers and altering the First Amendment. With the exception of tinkering with the First Amendment’s Freedom of Speech, it is an incredibly worthwhile book describing our problems and posing some solutions. I had known our politics had turned nasty. Davis, Frost and Cohen opened my eyes regarding why.